Face oils or face creams? That's the debate I've been having lately. I walked into Sephora a couple of weeks ago and bought the Fresh Seaberry Moisturizing Face Oil instead of what I had initially gone in for which was the Lancome Energie De Vie Dullness Relief & Energy Recharge Daily Cream (see my review here). Why are face oils better than creams? Face oils come without chemicals, toxins, and all the bad ingredients that creams can contain. Oils have been around for many years - but how is that we as a society have just discovered them? Most people are under the impression that oils can cause breakouts, are pore-clogging and make our skin look and feel greasy. But that's not really the case. Your skin certainly needs a certain amount of oil. Oils can transform your skin and keep it healthy. Facial oils are also a fantastic base for makeup because they plump fine lines, even texture and can give the appearance of dewy skin. This face oil in particular is made with Seaberry Oil. Seaberry oil (also known as seabuckthorn oil) is an antioxidant which is rich in moisturizing omegas 3, 6, 7 & 9. Seaberry oil is also noted for protecting the skin from aging free radicals. The Fresh Seaberry Moisturizing Face Oil comes in a thick glass bottle filled and a dropper. 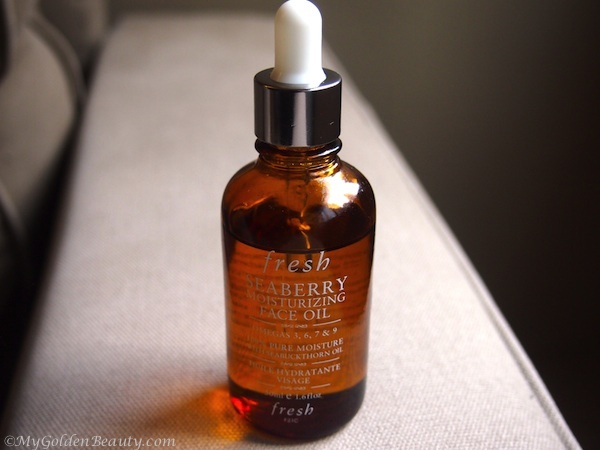 How do I use the Fresh Seaberry Moisturizing Face Oil? I use this product by taking the dropper and placing a drop or two on my face. Then I take my finger tips and massage the face oil on my face and into my skin. The oil feels lightweight and my skin doesn't look oily after. So how did I feel after using this product for three weeks? My skin felt smoother and hydrated then it was before. Especially during the winter months when the weather is dry I pay extra attention to my skin. The only complaint I had about the product was that it does have a strong smell. If you can get past the smell of the product then you'll love it! Will you be trying this product? If so let me know your thoughts!